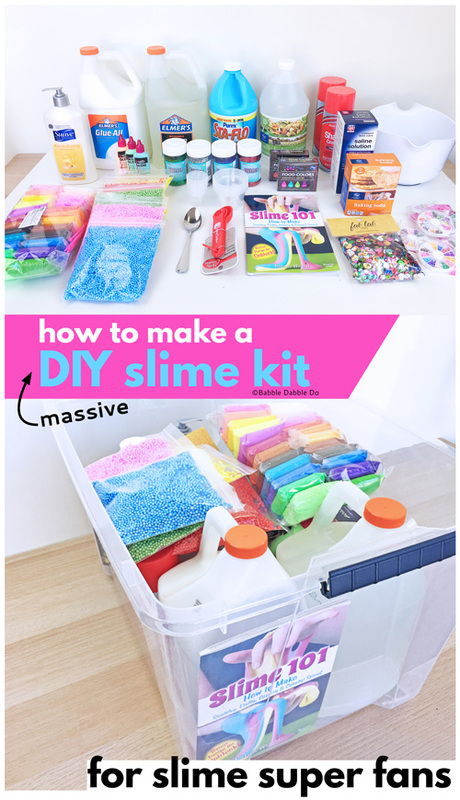 If you need a showstopper of a gift for your slime loving child, consider putting together this massive DIY Slime Kit that will keep them busy for weeks! Having hosted quite a few slime workshops, parties, and events people often ask me what to include in a DIY slime kit for their kids. 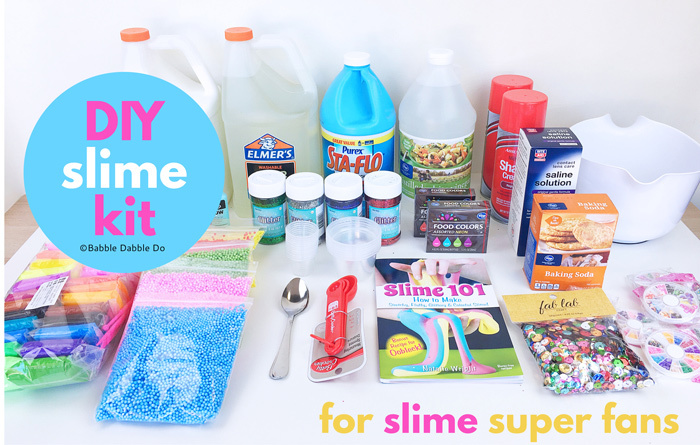 Today I am answering the call for what to put in the ultimate DIY Slime Kit for Slime Super fans! 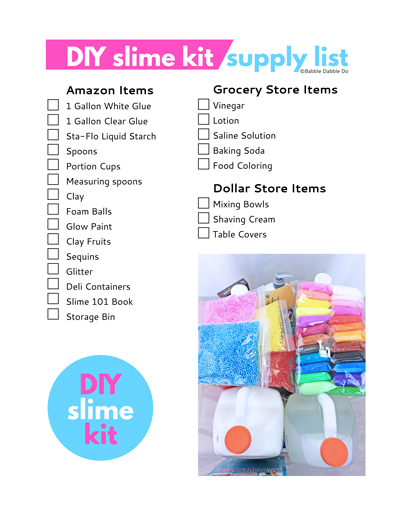 This list includes my favorite supplies with recommendations on where to purchase them, a printable shopping list to take with you out and about, as well as a printable recipe cards of four of our go-to slimes! All items are hyperlinked to Amazon. I’ve also compiled the items here on Amazon in one place. Please note this does not include Amazon pantry items. You may also access the shopping list on Amazon by clicking the pink button below. These items are best purchased online. 1 Gallon White Glue Glue is usually half the price online as it is in stores. HALF THE PRICE! Spoons I recommend metal spoons because plastic ones sometimes break in slime. 4 oz portion Cups I love portion cups because it’s easy for kids to measure out the right amount of glue. Wash and save them for reuse. 2 oz. Portion Cups Use these for the liquid starch! Soft Clay These colors make the prettiest butter slime! Clay FruitsThese look amazing in clear slimes! Deli Containers These are my favorite way to store slime once it’s made. They seal tight and they can be stacked. Slime 101 Book A nice primer on slime recipes! Storage Container Store all your supplies in a large bin! Consider getting a second one to store all the kiddo’s slime. Psst….these can also be purchased at Staples. Saline Solution Buy an inexpensive brand but make sure it contains boric acid. Mixing Bowl I have found these at the Dollar Store. They are great because the have a handle and rubber ring at the base to prevent the bowl form sliding around. Shaving Cream Stock up on shaving ream at the Dollar Store! Table Covers Great to have on hand to quickly cover a table. If you want a printable list you can take with you as you shop, click the image or button below to get the PDF. 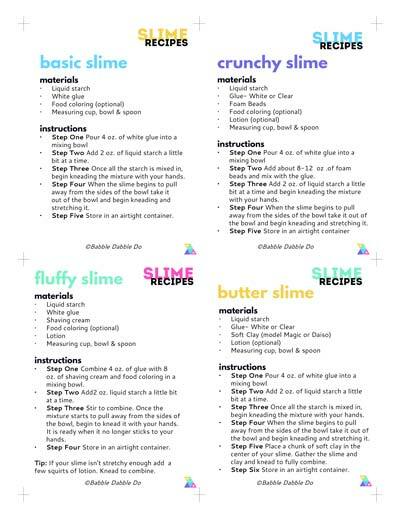 The PDF also includes recipe cards for our favorite slime recipe. Print the cards, cut and laminate, and include them in the kit! Okay if you want to be a superstar parent this holiday season this gift will do it! I promise!! !